The word is “deaccession”, a fancy way of saying a museum is selling off a portion of its collection. This can happen for many reasons. For example, the museum may have received a bequest that was outside the parameters of its collection, it may have acquired items in the past that are now outside of the museum’s mission, or it may sell off some lesser works in order to raise funds to acquire a more significant piece of art. In any case, the Boston Museum of Fine Arts deaccessioned a number of ancient coins, one of which I was able to acquire, and which you see above. A close up view is here. 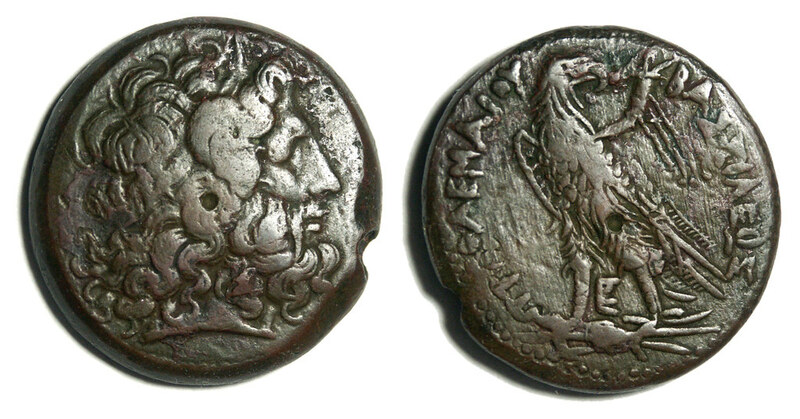 The obverse of this coin features a bust of Zeus/Ammon facing right. This was a composite god, conflating the chief Egyptian and Greek deities, under the Alexandrian practice of syncretism. The reverse shows an Eagle grasping a thunder bolt, with a cornucopia under the rear wing. The legend reads ΠΤΟΛΕΜΑΙΟΥ ΒΑΣΙΛΕΩΣ or “of Ptolemy, (the) King”. You may notice the small central pit on each side of the coin. This is called the “centration dimple”, and is an artifact of the production method. This particular coin type is a well-known type from Ptolemy IV, who reigned from 221 BC to 204 BC. The Ptolemies were the Greek/Macedonian rulers of Egypt in the period after the death of Alexander the Great and before the rise of Roman control. By all accounts Ptolemy IV was an ineffectual leader, more interested in orgiastic rituals than ruling the nation. His one notable military victory was at the Battle of Raphia in 217 BC where he defeated the troops of the Seleucid King Antiochus III. In this battle, Ptolemy supplemented his Greek army with native Egyptians trained as phalangites. This infantry advantage proved decisive, and Ptolemy won the day, preserving Syria and Palestine in Egyptian hands. This was a mixed blessing, since the Ptolemaic dynasty, foreign rulers of Egypt, had now to contend with the newly armed and trained Egyptians, as well as external threats. The reign of Ptolemy IV, including the Battle of Raphia, as seen from the perspective of an Egyptian Jew, is told in 3 Maccabees, a book canonical to the Bibles of Eastern Orthodox churches, though apocryphal to others. One last close look at the coin. Notice the “Ε” between the eagle’s legs? This the “regnal date”, giving the year according to the year of the rules reign. Epsilon (Ε) was the 5th letter in the Greek alphabet. This would this correspond to 217BC, the year of the Battle of Raphia. So, a nice piece of history. The coin I have appears to be exactly the same as the one described here, with one exception: the reverse eagle faces to the left, not to the right. Comments?